From the Greek Sing Chairs: In our haste to calculate and write down the final scores, we made an error with who won third place in the competitive division. Although we announced Thoroughly Modern Millie as the winner, the true winner of third place was Aladdin. All of the scores that night were correct and still are. This mistake was not a calculations error. The issue had nothing to do with final scores but was our fault as we, in our haste, wrote down the wrong winner of third place doubles. All other winners in doubles, singles, and philanthropy are correct. As a non-Greek affiliated student who had never seen Greek Sing before, I wasn’t quite sure what to expect Saturday night. As I walked up to the Soldiers and Sailors Memorial Hall, I was surprised to see the performers outside taking photos in costume. The excitement was already high. The performers themselves filled up most of the first-level seating in their elaborate costumes and makeup. The show began with an impressive, fast-paced step performance by Lambda Phi Epsilon. The remaining numbers were split into doubles (a fraternity-sorority pair) and singles (one fraternity or sorority). Some groups chose to parse together songs and dialogue from a movie or musical, while others rewrote the story into a college setting. One group wrote an original musical. Almost all the groups used a live band, which I found particularly impressive. In the singles category, Alpha Epsilon Pi took first place with their hilarious Spamalot, put in the context of fraternity brothers on a Monty Python-style adventure to White Castle. The original musical’s “You won’t succeed on Broadway [if you don’t have any Jews]” was a particular hit. 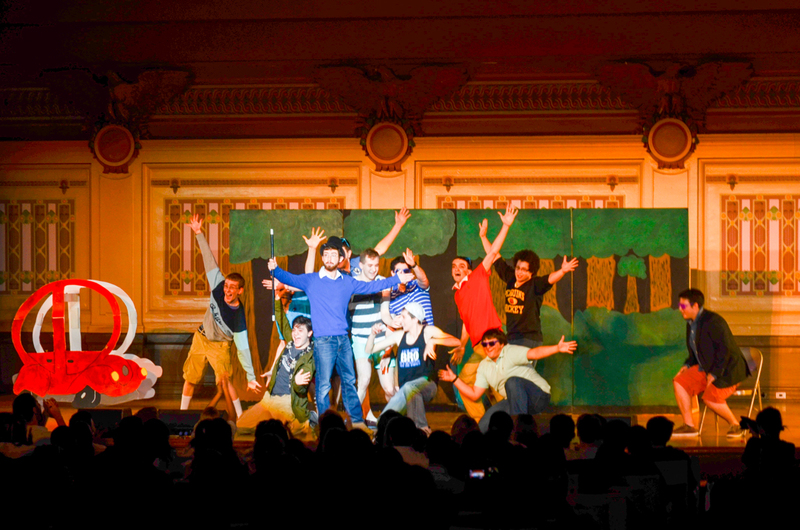 The production was also littered with kosher jokes and jabs at other fraternities, like Sigma Alpha Epsilon’s cardboard cutout costumes. The win was thoroughly deserved — it was the wittiest originally rewritten piece of the night. The second place prize in singles went to Sigma Alpha Epsilon for their original musical, Grocery Story. The fraternity used its signature painted cardboard costumes with short jean shorts. It opened with a Romeo and Juliet-inspired monologue and progressed to a feud between health foods and junk food at a local Giant Eagle. The hero, a Hot Pocket, had one of the best voices of the night. The show included an impressive selection of foods in costume, and small details like health food yoga sessions were especially funny. The foods resolved their differences when they discovered that healthy items taste better combined with junk food, like Twinkies and tofu. Both bizarre and funny, SAE deserved its second-place win with this piece. Alpha Phi received third place for their rendition of Mean Girls, which also included a song from Legally Blonde and a plot referencing The Hunger Games, closing with a Taylor Swift song. The story was more far-reaching across genres and source material, so Alpha Phi was able to vary the dialogue and make the piece more original. I appreciated that Trang Pak was the only girl to emerge from the arena alive. Though they did not place, Sigma Tau Gamma’s Avenue Q was funny and relevant to Carnegie Mellon, with songs about pining for college days and overcoming everyday stress. It was endearing, but fewer audience members were familiar with this musical and may have found it jarring (one song is titled “Everyone’s a little bit racist,” and Gary Coleman makes regular appearances). The rewritten sections were witty and the song selection was well done. They deserved more laughs than they got. The other singles performances were School of Rock by Sigma Nu, about an underdog team competing for glory, and Star Trek by Delta Upsilon, about the crew of the Starship Enterprise. Both of these included impressive dance breaks and had quite a bit of original dialogue. The doubles performances tended to stick to source material more closely, but the performances were just as impressive. The Lion King by Kappa Kappa Gamma and Phi Delta Theta included very impressive giraffe costumes, beautiful group dance choreography, and a clever transition from young Simba to his adult form (switching the actor’s race and gender). Aladdin by alpha Kappa Delta Phi and Sigma Chi was a whirlwind of colorful, beautiful costumes and impressive group dancing. The set was particularly impressive, and the writing included a nice balance of Carnegie Mellon jokes. I would have liked to see this piece place in the final judging. Pitch Perfect by Delta Gamma and Pi Kappa Alpha had the most original writing of the doubles shows, including fun jokes about “the other CMU” (it took place at Central Michigan University). I wish they had used more a cappella singing, but their live band was especially enthusiastic. The winners in the doubles category were Thoroughly Modern Millie, Wicked, and Seussical the Musical, taking third, second, and first place respectively. All three shows were impressive. Thoroughly Modern Millie was charming, as done by Alpha Chi Omega and Kappa Sigma. The soloist as Millie stood out especially. The group tap number was dazzling. This group may have had the highest all-around production value of the night, with their 1920s costumes and sparkling set. Delta Delta Delta and Delta Tau Delta teamed up for Wicked, which showed incredible vocal power. The soloist on “defying gravity” won over the crowd, but I was also impressed by their use of ensemble voices to elevate the group songs. The doubles winners, Kappa Alpha Theta and Sigma Phi Epsilon, deserved their victory with Seussical the Musical. The group pieces were stunning and the solo voices were perfectly suited to their roles. The costumes and set were fanciful. Some of my favorite touches included Horton the Elephant in an argyle sweater and the Cat in the Hat making faces and strange reactions in the background of each scene. At the end of the evening, everyone was reminded why Greek Sing happens at all. As a philanthropy event, Greek Sing raised over $86,000 this year. A representative from Our Clubhouse, a cancer support organization, gave a volunteering award to Delta Gamma sorority. Shraddha Joshi, a postdoctoral fellow in Mechanical Engineering, spoke about her experience surviving leukemia and how Our Clubhouse helped her. She brought the audience to a standing ovation. It was satisfying to know that the people around me, still in makeup and costumes, were just as enthusiastic about supporting Our Clubhouse as they were about the competition.